Have you ever had the chance to go on a safari and ride a banshee on the same day? For most, the answer is likely ‘no’, but that is exactly what I had the opportunity to do during my travels in the state of Florida recently. For those who are unaware, Delt chapter consultants travel 24/7 from chapter to chapter assisting them in many areas of operation. This means that we take our time off seriously. 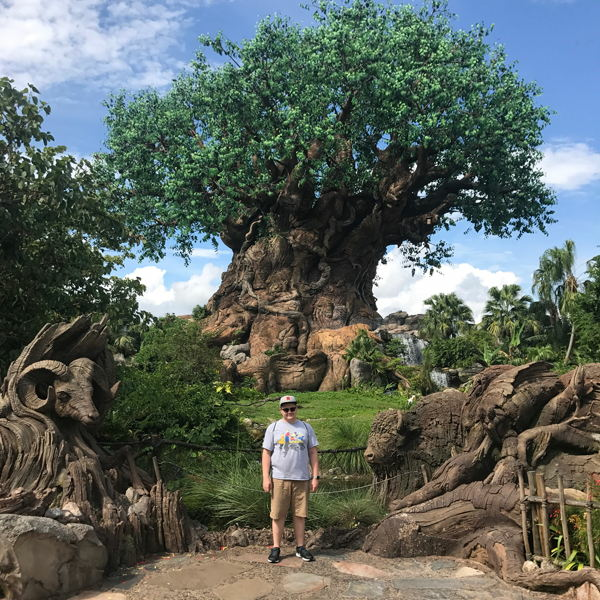 I had already visited both Epcot and The Magic Kingdom at Walt Disney World while traveling for the Fraternity, so I decided it was time to visit a park I’d heard many positive reviews about Disney’s Animal Kingdom in Orlando. I started the day by catching a shuttle from my hotel around 8 a.m. and arrived at the park shortly thereafter. I purchased my ticket ahead of time so I could reserve FastPass times (an essential for any Disney parkgoer), so once I waited patiently in the security line, I was free to explore. The very first attraction I rushed to was the Kilimanjaro Safari ride. It simulates a ride through an African wildlife reserve and includes many species, from giraffes to warthogs and elephants. I’ve included some pictures from the Safari for your viewing pleasure. Throughout the rest of the day, I experienced most of what the Animal Kingdom had to offer, but nothing was more exhilarating than the Avatar Flight of Passage attraction in the recently-introduced Pandora area of the park. Without spoiling the ride, I can tell you no matter how long the line is, this experience is worth waiting for if you ever have the chance. It implements virtual reality seamlessly, showing the effects modern technology can create. Despite 200-minute wait times, I was patient enough to go through the line twice because I enjoyed the ride so much. My time at the Animal Kingdom was unforgettable, and I was able to experience it thanks to my travels on behalf of Delta Tau Delta. It’s days like this, as well as my strong desire to help chapters improve, which keep my passion for this role so high.